My photo project 'Light Up LA' will be glowing up LA's Chocolate and Art Show next Friday ! Come soak in an art and music fueled night with me! CLICK HERE for tickets and event info. Its been a week since the last day of my second tour with @roadtripnation and as I reflect on this journey I am overflowing with gratitude from the growth, opportunities and magic I’ve experienced. 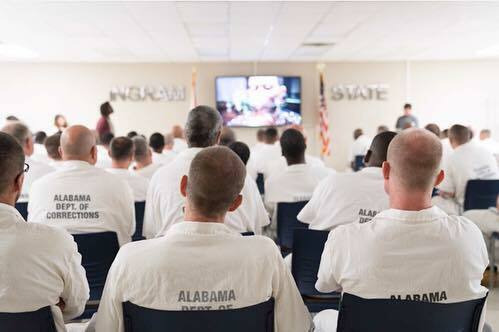 Today one of the roadies asked me what is the moment that has stood out the most from my tours, and I can whole heartedly say that it was doing an event in Alabama at Ingram State Tech College that also happened to be a Prison. Although in the beginning there were thoughts racing through my mind like “What can I possible say to someone who’s been in prison for years that can be inspiring and motivating? How do I relate to inmates raging in age from 20-60? “ But as soon as I stepped into the college building, I felt like I was in a “free world” ( as they call everything that’s outside of the prison) college. Staff referred to each individual as a student, I never heard the term inmate. As the students poured in and the presentation went on, they were all engaged, respectful and most of all willing to open up to us and their peers. I realized this might have been the first time for a lot of them that someone was asking them, what do you love to do? How do you think you can get to that? And more importantly encouraging them to drop the disempowering noise and go for it! This may have been a moment for many in which it was just about them, as humans, not inmates. I felt the sense of pride and emotion that came over those who chose to stand up, say their name instead of their inmate number and share what their true passions and goals were. I made a connection between the high school students we had been visiting and the inmates, they all heard noise, they all had passions, and they all wanted to follow their dreams. That’s what we were their to do, tell them that no matter where you are in life, you can make that happen, you just have to believe in yourself and go for it. They later on gave us a tour of their workshops, from welding and carpentry to upholstery and electrical, each jumping at the opportunity to geek out with us and show us what they are learning and what they had created. Before we left, two students ran up to us, one handing us a fish made of scrap metal that he welded himself, and the other a bag full of pillows that they had made in the upholstery class for us to take with us. Their sincere gratitude, excitement and genuine inspiration filled me with joy, compassion and hope in humanity. Featured by VoyageLA Magazine ! Visited West Point Military Academy! On The Road Again with Road Trip Nation! This week I started my second road trip with @roadtripnation and I couldn’t be more excited. I’m so proud to be a part of a team with a mission to inspire students and people around the world to define their own road in life and to pursue what they love. This time we will be on the road for two months driving down the east coast starting in Rhode Island - Boston - NYC - Philadelphia - Washington DC - Tennessee - New Orleans & Texas. Stay posted on my instagram @Rockmyworldrocky for adventure pix & stories. Live Interview with Mindful Models! Here is the full live interview with Mindful Models from their Soul Talk Series! Mindful Models is a social movement that promotes emotional, mental, physical, and spiritual wellbeing in the modeling industry. VISION - We envision an empowered, inspired and joyful world made up of creative individuals committed to building a sustainable future for humanity. MISSION - To bring mindfulness into the fashion, modeling and entertainment industries and create a community that is nurturing and supportive. To learn more about Mindful Models, CLICK HERE! On the Road with Road Trip Nation! Six weeks ago I set out on an adventure to tour the country, living in a giant green RV with three other roadies and a mission to inspire students to define their own roads in life. We drove from California-Oregon-Washington-Montana-North Dakota-Minnesota-Wisconsin, ending in Chicago,Illinois. We explored the cities and nature in every state, but most importantly we spoke at high schools and community colleges with the intention to inspire and motivate students to build their life according to their real interests and passions. At first public speaking to a room full of students wasn’t easy, but I quickly realized that when showing up with complete authenticity and sharing my own journey it just became a conversation. No matter what our circumstances are, if we are dedicated, focused and believe in ourselves, we will have created a life we love that is inspiring for ourselves and those around us. It’s unbelievably hard to describe the trip in its entirety, from the roadies that became my family to the students that became fuel for my own inspiration, but I will say this, hope for a brighter future is not only alive but strongly taking form. I am so grateful to have been a part of this journey and for all the beautiful lessons and magic I have witnessed. I’ve not only become more compassionate but a more active listener, having to constantly adapt to different demographics and kinds of students, really put myself in check as to what am I communicating and how can I communicate better, making me not only a better teacher but a better student. Thank you so much @roadtripnation , finding you was like finding a pot of gold at the end of a rainbow. Thank you for your hard work and for getting this message out on the road, where it matters most. We end our presentations with a final piece of advice like our founders asked of the leaders they interviewed, which propelled this movement. My last piece of advice is:Just be you, know that your being seen, loved, inspired and inspiring, because your you. World peace is no more than you, it’s in your heart, it’s in your mind, it’s everything inside of you and so world peace is here, it’s happening now, through you. So be World Peace. 'LIGHT UP LA' showing @ ART HOUSE NYC for Digital Art Fair! Very happy to be part of SPRUNG, a curated digital art & photo fair! ARTHOUSE.NYC teams up with New Max Films & aRtx cares in a new space on White Street to spring forward. "Light Up LA" - In this project Raquel Natalicchio uses Urban Light Painting, a self-taught technique in which the camera moves instead of the light source . By using the lights of the city in the buildings, streets and sky as a paintbrush, Los Angeles lights up in a brand new and engaging way. Link to Event Page: CLICK HERE! Get your book before they hit stores! 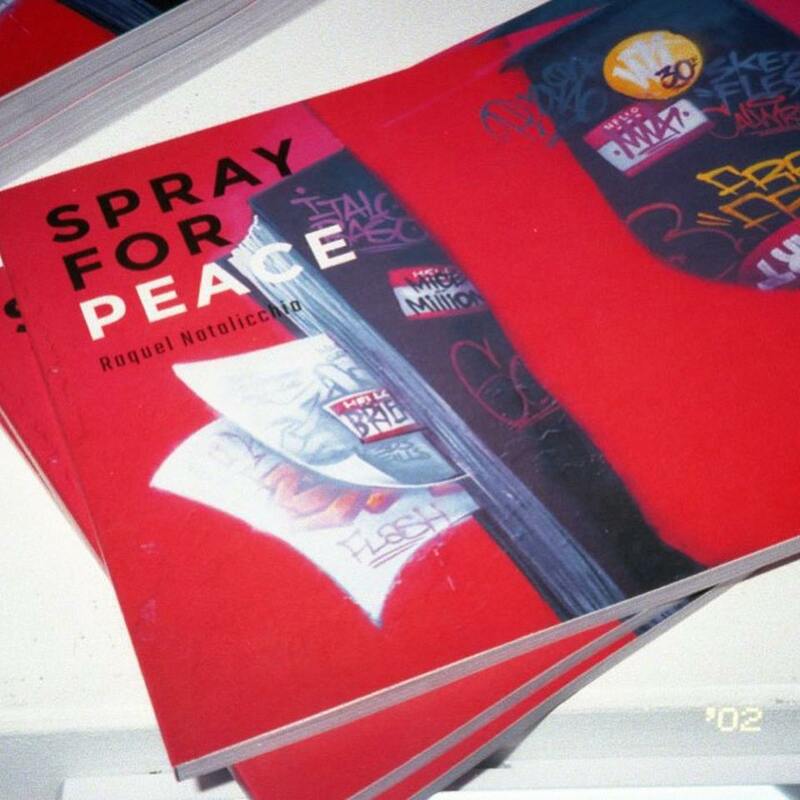 'Spray For Peace' Book Release Show! Best in Show for Art House NYC! So excited to announce I was selected as Best in Show by Art House NYC for Frieze Week in NYC! The image below was selected as part of a group show with the them " Peace de Resistance", out of the many talented artists along side me exhibiting I am so honored to have been selected. Thank you Art House NYC ! Light Up LA illuminates Hollywood for Salsa Sundays! Every Sunday of May I will be displaying 'Light Up LA' at Candela on La Brea in Hollywood. This after brunch event offers an amazing Live Salsa Band playing well known songs such as She's So Heavy by The Beatles and Californication from The Red Hot Chili Peppers. You don't want to miss this new age spanglish transformed band. The photos I have on display are uniquely printed on glass and back lit by an ultra thin LED screen, making the lights of the city glow. This is an event to look out for, not to mention great happy hour specials! Come by Candela on La Brea every Sunday for the right way to rehab for a great start to the week! Click HERE! for the event page for more info. NYC Art House: Peace De Resistance Group Show! So excited to have been selected to exhibit with NYC Art House for their Peace De Resistance Group Show during Frieze Week May 4 – May 7 ! 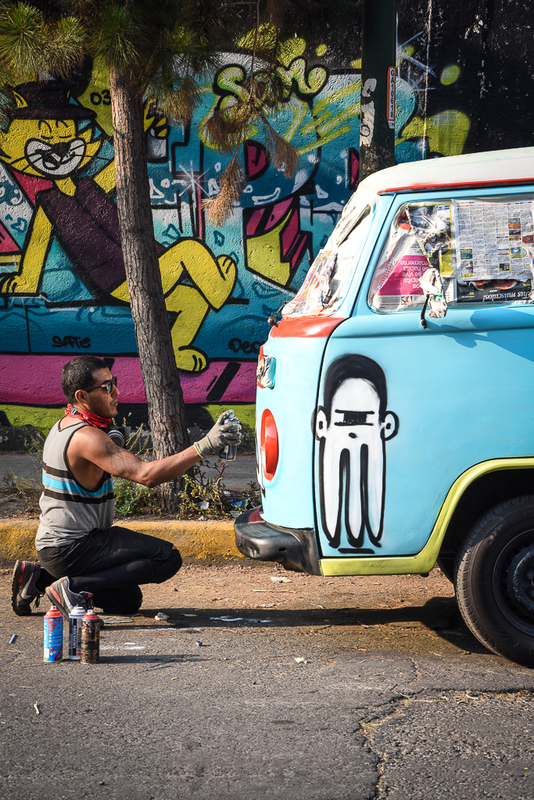 Graffiti artists from across Mexico and US unite over two days in the colony Nueva Vallejo in Mexico to create murals as inspiration for local residents to take action in bettering their community through art. Neighborhood resident observing 'Peyote' painting for the ' Mi Nuevo Barrio Art Festival' in the colony of Nueva Vallejo, MX. North of Mexico City in the colony Nueva Vallejo, 'Mi barrio Resurge Festival de Arte' was born from the concern of neighbors to improve their neighborhood and give an example to the rest of the city how art is able to create a better environment to live in. From February 4th to the 5th, 22 artists including some of the best from all over Mexico along with artists from Los Angeles and Detroit in the US, gathered to paint three blocks worth of walls. Collaborating organizers Idalia Lopez and graffiti artist ‘Ashes’ teamed up representing residents speaking out to better improve theirneighborhoods from within community cultural and art committees. The two organized with graffiti paint shops, artists and neighbors, first choosing a location, then artistic themes and color schemes for each wall, resulting in mandalas, free wall and nature inspired themes. Some neighbors even came out the day before the event to help prepare the walls for the artists. “This festival is about bringing color and life back to the streets, but more importantly its about getting people together and actively involved in making their community a better place. Gentrification is inching its way towards our community, so we want to set the pace and do things from our point of view. ”said organizer Lopez. Throughout the two day event, artists painted from morning to sunset while neighbors passed by. Residents stopped in their tracksmesmerized in wonder having never seen not only their streets filled with color but, so many artists all painting at once. “ Im happy that every time I open my front door I will see thesecolorful walls, I wish all the walls in the community looked like this.”said a resident whose home is across the street from the walls being painted. With every piece being created independently by a different artist, it was interesting to see the unison of all the pieces on each separately themed wall.Within a couple hours into theirpainting, there was a moment where every artist was in sync to their neighboring artist. French graffiti artist ‘Trust’ now living in Mexico City said “ I’m just throwing my emotions on the wall, right now I feel differently than I did when I painted the inside of the letters earlier, so now I have to change them as the piece is constantly evolving with myemotions and environment” The sense of freedom created by the welcoming of the community set a very serene tone for the artists to work with. The neighborhood was buzzing with positivity and excited chatter. Someneighbors even asked the artists if they could come paint the walls in their gardens and streets. One neighbor in particular asked a couple artists to paint his work van, he brought his two young daughters to watch with excitement. This was the first of a two part festival revamping the streets of the community, bringing them back to life with vibrant art. The second festival will be happening in the same fashion in April, with even more artists, both national and international. Night on Broadway was so much fun! Felt like all of LA was there. I had the pleasure of showing in the mezzanine of the infamous Ace Hotel Theater. I showed the project 'Light Up LA' featuring my new LED back lit glass frames. Take a look at the photos! Talking Peace Festival @ The House of VANS! 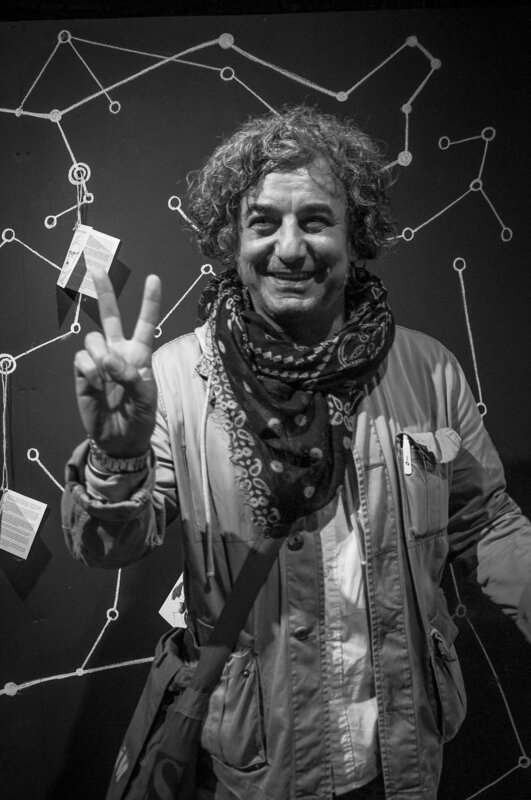 The "Talking Peace Festival' hosted by 'The House of Vans' in London on International Peace Day Sept.21, 2016. The peace talks lasted two weeks with an array of cultural events that allowed people to discover how creativity can bring people together and resolve conflicts. One of the biggest conflicts affecting humanity today is that of the Syrian Refugee Crisis, and in honor of that the first week was dedicated to the installation 'Create Syria', which explores how arts can build a better future in the wake of crisis. 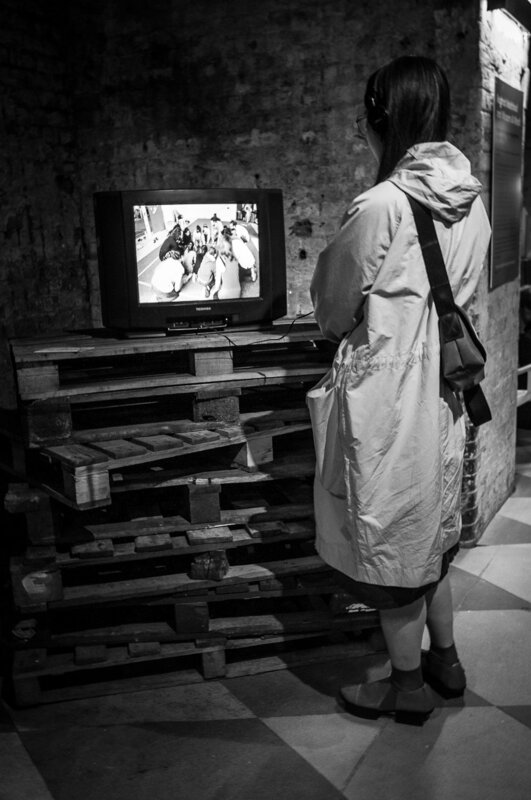 The exhibition, curated in the atmospheric tunnels of House of Vans, Waterloo, London (22 September- 2 October 2016) will showcase the stories and works of several exiled Syrian artists and cultural figures living in Lebanon and working in diverse art forms such as theatre, film, painting, animation and music. The featured artists have all been running workshops for displaced Syrian children and young people in refugee camps and other communities across Lebanon, using art to promote self-expression and collaboration. Their message is that Syria is not just about destruction and crises, but also re-growth and creativity. The exhibition was inspired by a project run by Alert in partnership with the British Council and the independent cultural organisation Ettijahat in Lebanon. It is curated by Ying Hsuan Tai of Goldsmiths, University of London. This video is an interview with syrian refugeee filmmaker, Hisham al-Zouki who directed a short film, The camp and my parents‘ story, which documents the oral memories of Syrian refugees living in Lebanon. The film has been created as part of a series of workshops for Create Syria teaching young refugees how to direct and edit films. For Hisham, art is a process of dismantling society and putting it back together again. The goal of their project is to overcome the marginalisation of young people, to transform the current conflict and to continue using the power of film to foster change through storytelling. Visiting Co-LAb Gallery in Highland Park! Co-LAb Gallery is Highland Park’s latest addition to the community’s booming art scene and a space that is transforming the gallery concept into an accessible and affordable community space. It was such a pleasure writing and photographing this story, <3 make sure to check this gallery out, what they are doing with the community is truly inspiring! Spread the LOVE! See the Pix and article! Highland Park is one of the oldest neighborhoods in the city. 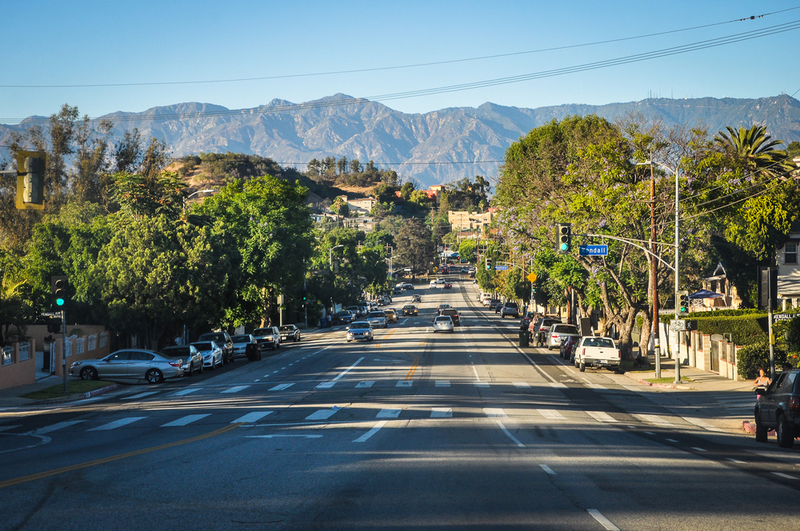 The neighborhood is nestled in the hilly area above Downtown LA along the Arroyo Seco, making it feel urban, yet suburban at the same time. Highland Park strikes a harmonious balance between grunge and classic LA elegance. To Read the Full Article and see ALL the Pix CLICK HERE!